1. Talk Rural – Join Canadian ruralists, from farmers and artists to healthcare providers and community builders, for this unique opportunity to discuss solutions to rural issues and challenges. Learn more. 2. Keynote Speakers and Expert Presenters – Connect with more than 60 speakers and presenters who will share their expertise on topics in arts & culture, food & farm, community revival & development, and sustaining & growing rural populations. Meet our keynotes and presenters confirmed to date. 9. Kitchen Table Conversations – Great ideas often come from conversations had around a kitchen table. Kitchen tables will be found throughout the conference to provide a spot to delegates to informally discuss innovative solutions to the challenges facing rural communities. Do you have a kitchen table to share? 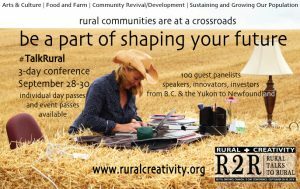 BLYTH: From September 28th – 30th 2016 the Canadian Centre for Rural Creativity will host the first Rural Talks to Rural Conference. Ruralists are invited to Huron County to network, share knowledge and meet other innovators from across Canada. From farmers to artists and healthcare providers to community builders we’ll inspire collaborative and creative thinking to discuss solutions to rural issues and challenges. The Conference will focus on four different categories including Arts & Culture, Food & Farm, Community Revival/Development, and Sustaining & Growing Our Population. Each of the goals or issues will have panels, conversations, and presentations. For example, Arts & Culture will feature a panel on why we need our stories told and from Fibre to Fabulous – fashion from the ground up. Under Food & Farm there will be a panel on creating jobs through processing local food and farm products as well as raising capital for your business venture. Community Revival/Development will have presentations on Rural Health & Wellbeing as well as The Creative Economy – reimagining rural assets and return on investment. And, one of the Sustaining & Growing Our Population presentations will be on Youth Entrepreneurship while another explores immigration – Are we prepared for New Canadians? Are we welcoming? Are we friendly? To get the ideas flowing many events have been organized for the conference. These include The Pitch, The Catch (an opportunity for entrepreneurs to pitch their ideas to potential investors), Kitchen Table Conversations (an informal setting to encourage dialogue and connections), tasting events, a pig roast and a Gala Dinner where delegates will enjoy the bounty of the County, and many more great opportunities for creativity and engagement. Pricing on the conference will range from $350 for all three days sessions, meals, hospitality, and entertainment: $200 for one full day (Sept. 28th or 29th), or $45 for dinner, keynote, and evening entertainment (either date – Sept. 28th or 29th). Students are encouraged to participate too – $225 for full 3-day conference. Rural Talks to Rural 2016 is presented by the Canadian Centre for Rural Creativity and generously supported by the County of Huron, the Township of North Huron, Huron Business Development Corporation, The Rural Voice, Rural Ontario Institute, Huron Food Action Network and the University of Guelph. The Canadian Centre for Rural Creativity (CCRC) was developed to build a unique cultural hub that addresses issues facing rural communities and accelerate economic growth and social renewal in Huron County and beyond. The CCRC will inspire people through art and nurture creative thinking in order to identify new economic, creative, and recreational opportunities. The CCRC operates within the mandate of its parent company Blyth Arts and Cultural Initiative 14/19 Inc. as a not-for-profit charitable organization working in partnership with the community to develop a cultural strategy that provides unique educational and artistic opportunities, meaningful employment, and increased quality of life for all through culture and art.